Entertainment journalism has become much more of a numbers game. Entertainment journalism has changed dramatically since the days of Goodfellas’ original theatrical release. Today, such a topic often engenders enumerated headlines. Saturday night’s screening event Q&A was moderated by Jon Stewart. Absent from the proceedings were director Martin Scorsese, currently in Taiwan filming new movie project Silence, and Joe Pesci. 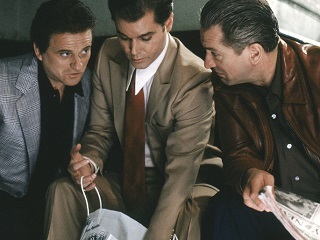 Intriguingly, as noted by various outlets, last week’s Black Mass trailer scene featuring Johnny Depp as Whitey Bulger was perceived as an echo of Pesci’s most famous outburst in the 1990 Scorsese classic. And speaking of classic, Pesci’s 1994 Late Show appearance (below) still stands as one of Dave’s liveliest early interviews.